HARRISBURG, Sept. 26, 2011 – Hundreds of local seniors packed the gymnasium at Camelot’s Excel Academy for state Sen. Christine M. Tartaglione’s annual Senior Expo. 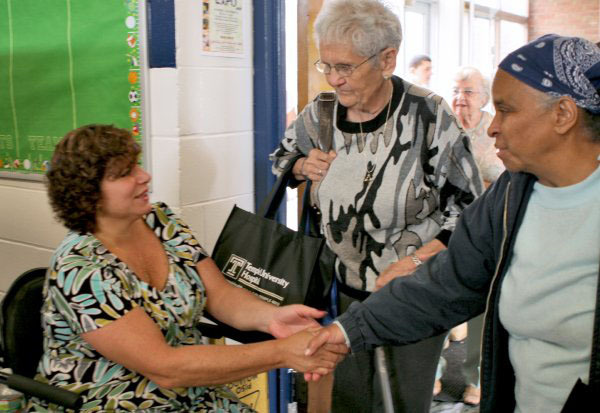 Sen. Tartaglione greets visitors to her Senior Expo at Camelot's Excel Academy. Click on photo to view gallery. The Senior Expo featured dozens of exhibitors with products and services that can help seniors navigate the sometimes complicated system of services available to them. Students from Camelot’s Excel Academy helped transform their gymnasium into a crowded marketplace that included free help from state, federal and city agencies, as well as vendors ranging from home security systems to therapeutic footwear.